In the saga of another long-term project, I am nearing the end of my Test of Honour small-game board. 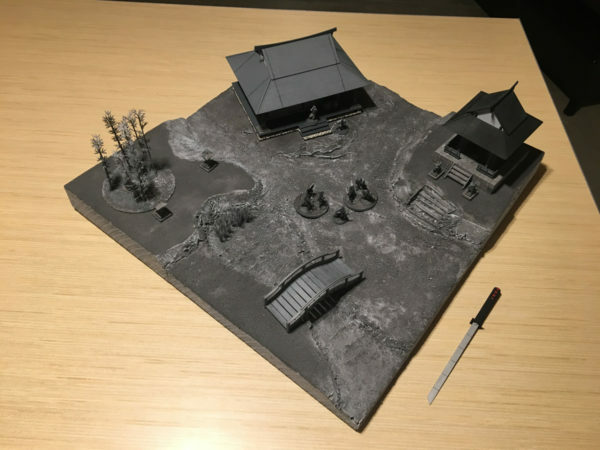 This 2′ x 2′ board will be used to run micro games of very small groups like my Dojo Assault scenario created last year. I finished up applying my homemade wash earlier and wash able to add some of the near-final details like dry brushing and some permanent plants. 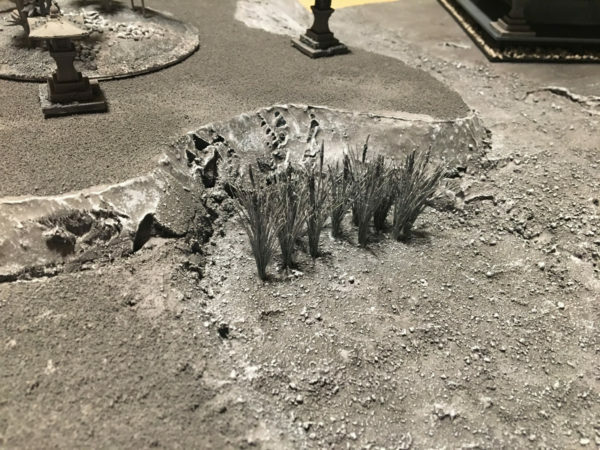 I can’t help but throw all my terrain down when I pull this board out. The dry brushing really helped bring out the texture and make so of my more hideous foam cuts palatable. These simply scenic cattails will be at the end of an eventual water feature. They didn’t paint up very well in grayscale due to the density of the leaves but most of the base stalks will be covered by the water so hopefully it won’t be too noticeable. The simple dry brushing spanned the entire board and I used a crappy cheap 1 inch brush from Home Depot. I can’t say that I’d recommend that again as the bristles kept falling out and I’d have to blow them out of the terrain before they got stuck. After these elements were dry, I used another nice day to throw a couple of matte sealant layers down. With the board sealed, I can tackle the last challenge- my resin water feature. I’ve been watching some good tutorials so I feel confident it will go well. Until then, the ninjas will wait. 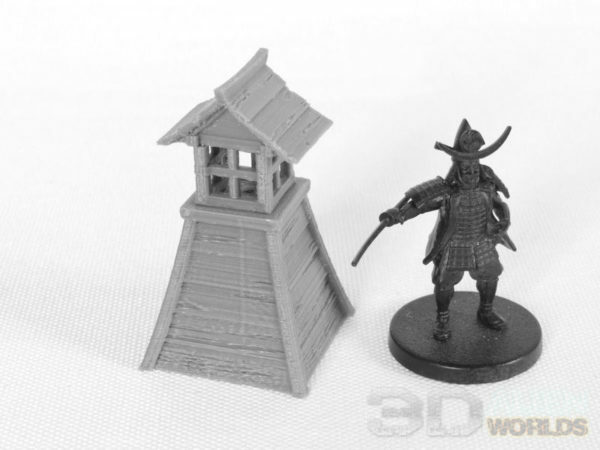 One other little Test of Honour item (sort of): I found these great 3D print files for battery powered lanterns and I’m excited to try them out soon. I’m not associated with 3D Worlds at all but $2 for the simple lantern file is easily worth it to me so I picked up a file to print later. I believe they also have an option to buy printed copies as well but I don’t have any experience with that service. Love that little board and the exploration of ‘micro gaming’ strikes a cord with me as well – recently I’ve been seeing ‘how low I can go’ board-wise and have surprised myself as to what can be achieved in a traditionally tight space. 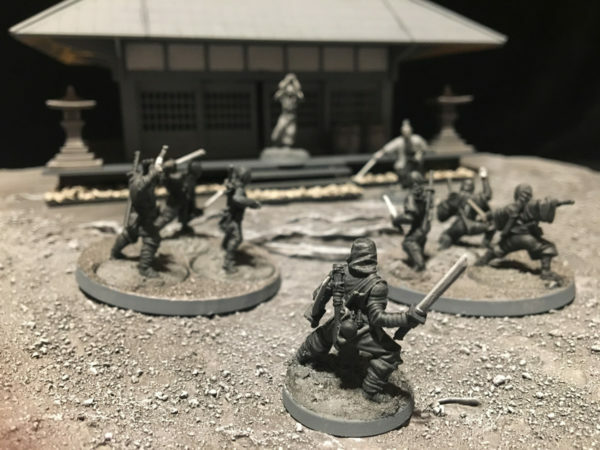 The rules you’re playing – Test of Honour – recommended? Anything else you’d suggest that’s worth exploring? Personally I’ve been using Rogue Planet. Oh, and I’m very much looking forward to seeing your water effects – best of luck! Yeah, while I’m glad I built a 6’x4′ table, that doesn’t mean I want to use that entire space. I think we were pushing the limits when we ran a Frostgrave game with 6 players on a 3×3 map. Having models walk-on helps maximize the board space. Dropzone Commander is another game that I think can shrink down a little as the smaller games can be played on a 3×3 instead of 4×4 (assuming units walk on and don’t directly place). 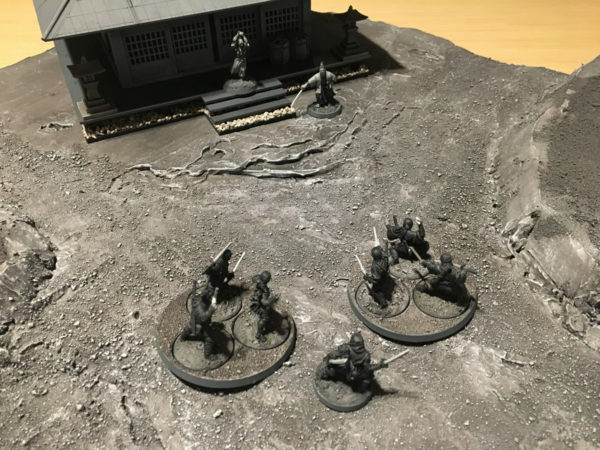 I like Test of Honour- it is light and brutal and has a stripped down campaign. I do not recommend the starter unless you love putting together uninspiring, multi-part figures for weeks on end. If you can hold out until the summer, the designers have started their own publishing house and are making ToH 2.0. Supposedly, they are mostly updating things to allow for expandability and clarifying old rules but the nice thing is they will be publishing a “no-minis” starter with just the rules and cards/dice so that people can use existing minis or source their own. Other than ToH, we’ve been diving into Frostgrave and I’m hoping to explore the alt-western Dracula’s America.